This is another super easy sketch that you can do quickly in your sketchbook or on one of the art tiles I am using. While these tiles are not for watercolor, they can take several (less wet) layers of watercolors. I also like how tiny and compact they are. And if you ruin it, you can toss it and grab another one – no harm done. Wet the watercolor paper with a thin layer of water. In this case I am using a flat brush to cover the whole area quicker. For the wet-on-wet technique it’s important to not add too much water. You want a smooth, glazed surface, instead of paper that is dripping with water. Step 2. Sketch the body of the crab. Start sketching the crab as a circular-like shape with a slight angle at the bottom. The crab’s claws will be composed of simple shapes: a small rectangle and a curved line that resembles a tulip. For the crab’s legs, think of them as one curved line that is composed of 4 brush strokes. Each line is slightly curving towards the crab. This also helps show the natural joints that a crab leg may have. 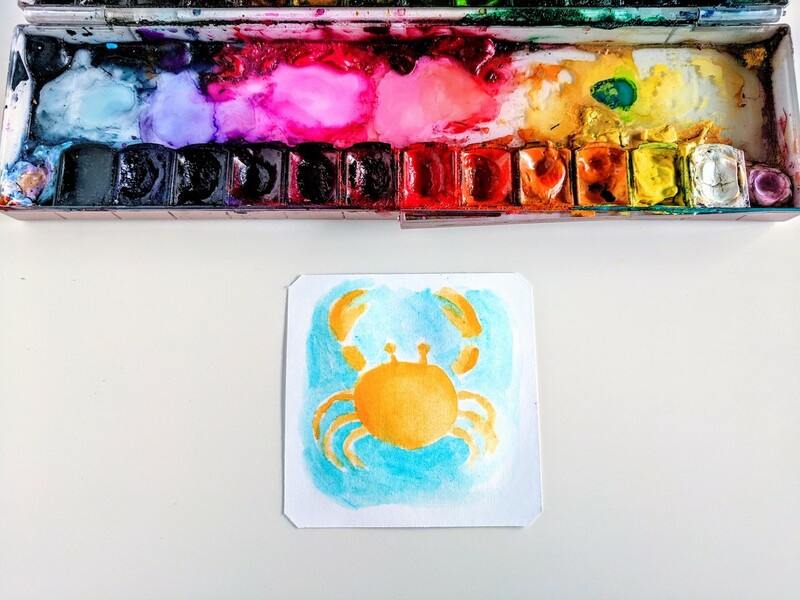 Our happy little watercolor crab will need some eyes. Those are composed of a line and a dot at the end. Fill in the background with a blue shade of watercolor. 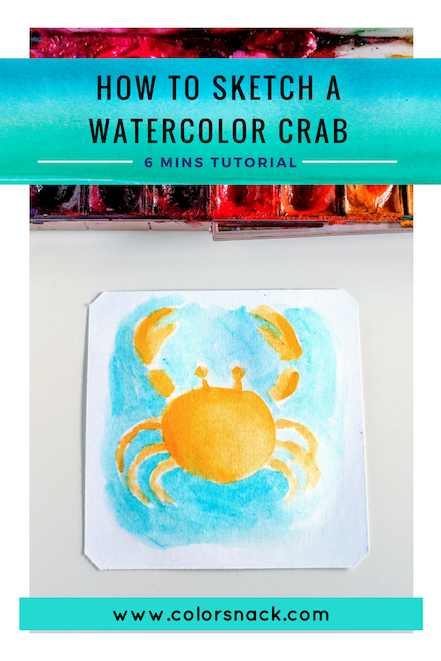 I am using the blue pastel here and going carefully around the crab sketch with my waterbrush. Since we are not using traditional watercolor paper, I will not re-wet the surface when I fill in the background. Otherwise, the tile might mess up if it takes on too many watercolor layers.